Pioneer Girl is in Design! The Annotated Pioneer Girl is finally in the design stages! 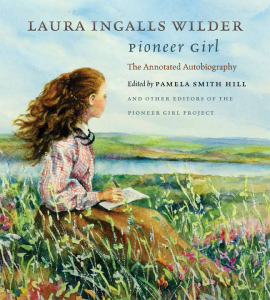 After several delays, the South Dakota State Historical Society Press has announced that the annotated version of Laura Ingalls Wilder’s original memoir, Pioneer Girl, edited by Pamela Smith Hill, is nearing completion and slated for publication later this year. I’m sure we are all anxious for its release; I know I am! Abandoned buildings…where the “No Trespassing” signs translate to “Please Save Me” in the Preservationist language. One of my favorite bloggers, the woman behind “My Bright Spots,” has some wonderful insight to how women sometimes find themselves behaving against their own personality when working in a male-dominated field…regardless of how talented and experienced we may be, there are times when we don’t speak up, or take a needed break, because we are the sole (or one of a very few) representative of the gender. I’m a woman who works with men most of the time. Always have. When I was a teenager, I was active in Explorer Scouts, an extension of Boy Scouts of America. It was co-ed, but still mostly guys. I went on to college where I majored in Electrical Engineering. By the last half, I had settled in with a nice group of 4 or 5 girls, but most of my classmates were men. Then I got a job in Software Engineering, again, men. This has never bothered me, particularly. I get along with my male coworkers. I’m not a high-strung woman that takes offense easily. I’m not overly girly in my speaking or mannerisms. I wear jeans and tennis shoes to work, just like any of the other guys.